The United Nations is at risk of running out of cash, the UN Secretary-General Antonio Guterres, has warned, sounding the alarm that the situation is the worst in years. 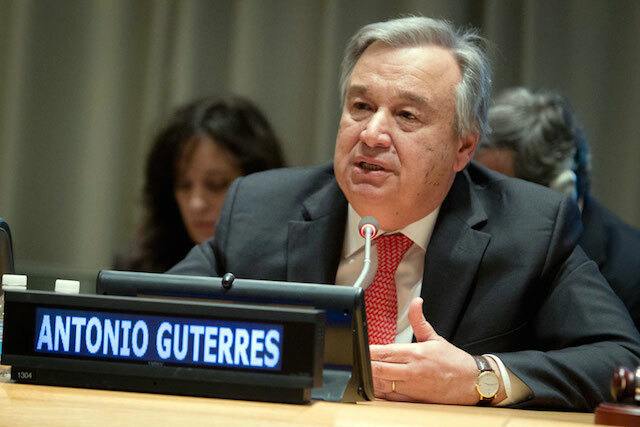 In a letter to UN staff, the secretary-general stated that he had “written to Member States regarding the troubling financial situation facing the United Nations”. “Our cash flow has never been this low so early in the calendar year, and the broader trend is also concerning: we are running out of cash sooner and staying in the red longer”. Nigeria has paid its annual dues for 2018 in full, making it the 74th out of the 193 member states of the global intergovernmental organisation to fulfill its financial obligations. The General Assembly in December approved a 5.4 billion dollars two-year budget for the United Nations, which was separate from the UN peacekeeping budget. A total of 112 out of the 193 countries have paid their dues in full as of July, but this list did not include the United States, the UN’s number one financial contributor, leaving the outstanding amount owed for 2018, at nearly 810 million dollars, with 81 States yet to pay. Speaking to journalists at UN Headquarters, UN Spokesperson Stéphane Dujarric said that the UN fully understood that some Member States operated on different fiscal timetables, but unlike in previous years, the cash flow had never been this low, so early in the calendar year. The spokesperson added that the UN Secretariat would now be looking into ways of reducing expenses, with a focus on non-staff costs.